At times I and I feel many users would want to jump to a specific video and not follow the sequence. this is a deal breaker for me, and as i’ve found with many other users. view lectures first, do assignments later. Coursera forces you to follow everything sequentially, at multiple times there are situations wherein you have understood the content of a session a particular week but you will take some time for the assignment and you want to parallelly work on the assignment as well as view next sessions videos just to stay ahead. but you can not. I completed 1 part of the Interaction Design Specialization online, but later it became difficult to stick to the browser and follow the sequence. Hence, i like to do the stuff offline and want to download the complete content of a specific course and go through them without the constraint of a browser, go through notes, slides, understand the content. Research on the content and create my own notes. However, this is not simple in Coursera as the downloads are not easy to do. Create Folder Structure Mimicking the Course structure. 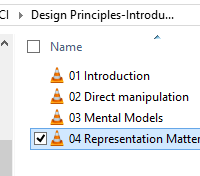 Put the data in these folders, Rename Files so that they seem in sequence as of Lectures. Probably this is by design ? There are many e-learning providers which give downloads a course in a very structured way, e.g. Lynda.com, Pluralsight.com, etc. Each content is neatly arranged in files and folders with no trouble to get started and use it. Coursera is soliciting feedback from users on the site, however they are probably not applying common-sense in soliciting the feedback. About a month ago i received an email soliciting feedback about HCI-Introduction course via a Video conference. I was proud that Coursera would consider my feedback, i promptly went to register for it. But sadly there was no time matching my timezone, All of the time slots were as per what the Interviewers are comfortable and not the users. Not a good start probably. I found overwhelming workarounds for this problem. Tired of downloading the files manually, renaming, arranging in folders, i got to Google and searched for Coursera Downloader and voilà Coursera-Dl a workaround specifically around this problem was already existing. The stat on the script says it all as of writing this post. Remember, these are technophiles who know what is a CLI and what is python and pip. Meaning a lot of non tech savvy users have just avoided this workaround and settled for doing things manually. I know its required for Coursera to deliver course content in sequential way and to ensure that users have viewed the content. Users can update the progress later when they are done learning offline. Just my two cents on Coursera improving Usability.